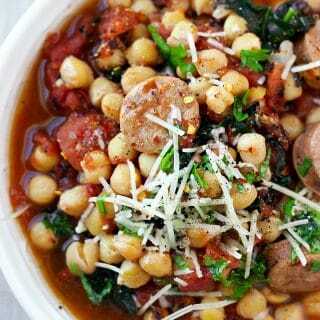 Easy One Pot Stovetop Lasagna, a complete one-step, no-mess meal with added nutrition powerhouse bone broth collagen. 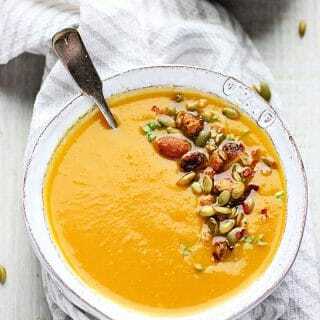 Saying goodbye to summer isn’t easy but Fall has a way of comforting us with all the warm foods and flavors that’s hard no not give in and fall in love with the season. 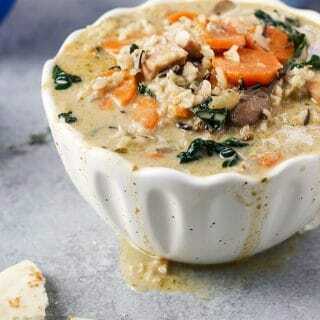 When the cooler weather arrives, there is nothing more warming than a hot pot boiling away on the stove. This One Pot Stovetop Lasagna is that comforting meal you need without the extra steps and dishes to clean. 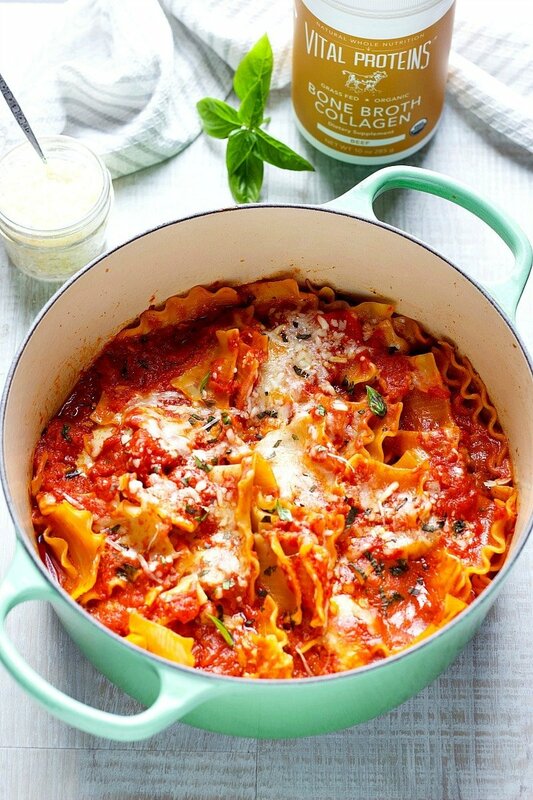 Traditionally made in the oven, lasagna is a two step-process that starts on the stove and ends in the oven. Not a big deal right? 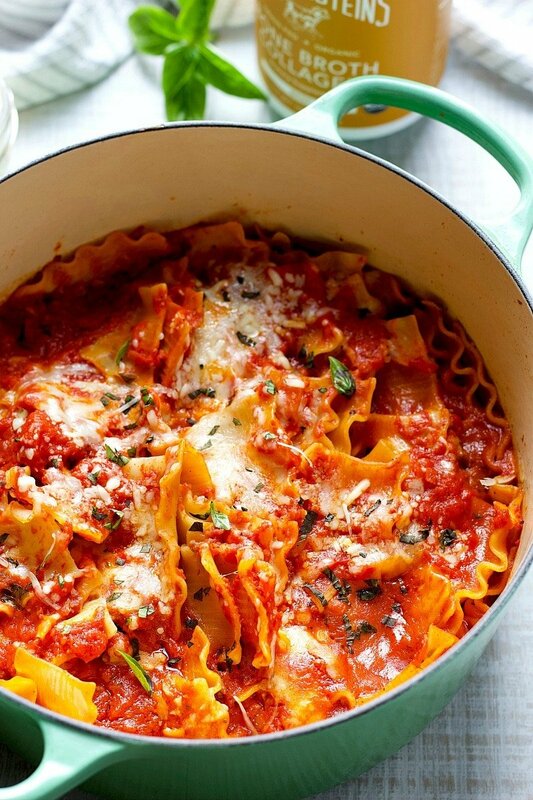 Hmm sort of… I love making Oven Lasagna and my family don’t seem to mind when I do. However, by the time I am done cooking the sink is full of pots, skillet, colander and spatulas and the stove is a mess! 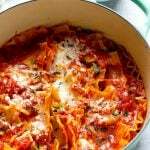 This one pot stovetop lasagna is a no-mess alternative that’s perfect for the busier weeknights because is all done in one pot, no extra steps or dishes to clean and it’s ready much quicker too. That simple! However, what’s even more exciting about this One Pot Stovetop Lasagna is the addition of Vital Proteins Bone Broth Collagen. 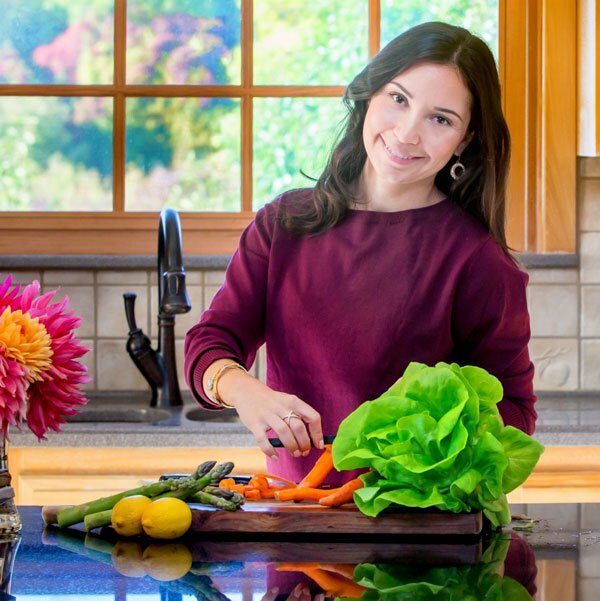 It’s no secret I love adding collagen to my recipes, from drinks, to baked goods, nut butters , popsicles and oatmeal, I am a big fan of that added benefit and with Fall arrival, I am looking forward to adding Vital Proteins Bone Broth Collagen to a lot of my recipes. 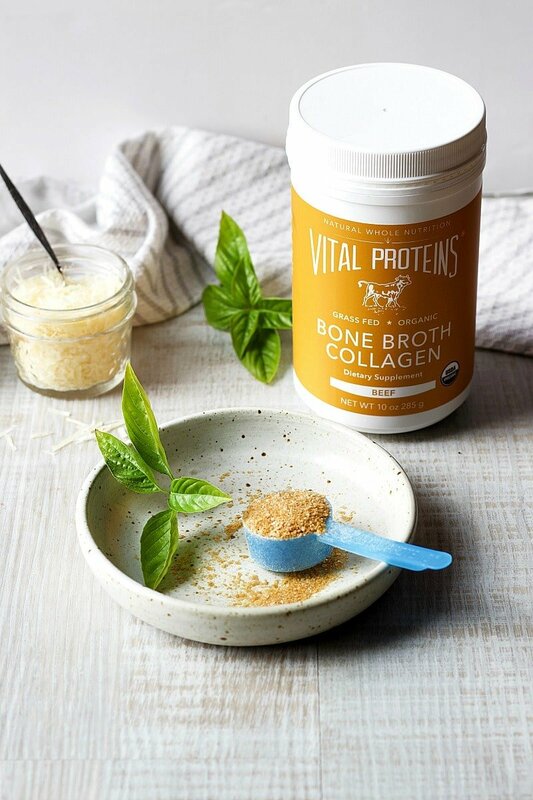 Vital Proteins Bone Broth Collagen comes in two flavors; Beef and Chicken. Both bone broth collagen are low sodium, MSG free, USDA organic, and rich in vitamins and minerals. Some of the benefits of drinking bone broth are; supports digestion, aids in immune function and promotes overall health and wellness. It’s basically like sipping your way to good health! Alternatively you can turn this stovetop lasagna into lasagna soup, if you add more broth to it, which is an enticing option if I may add. 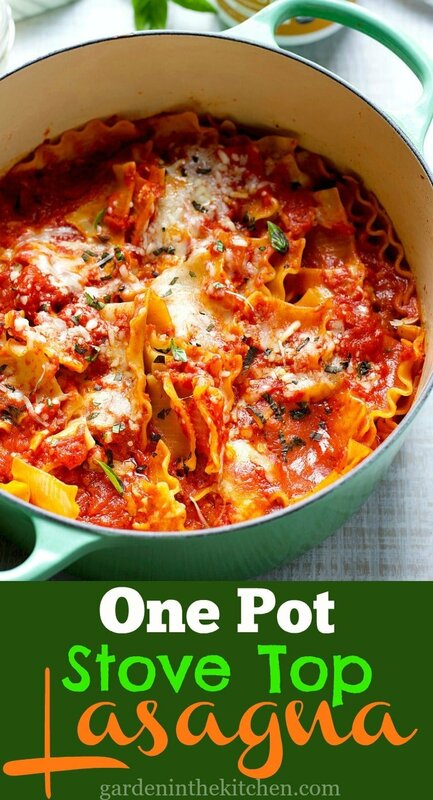 Otherwise this one pot meat lasagna is a great meal that everyone will enjoy. 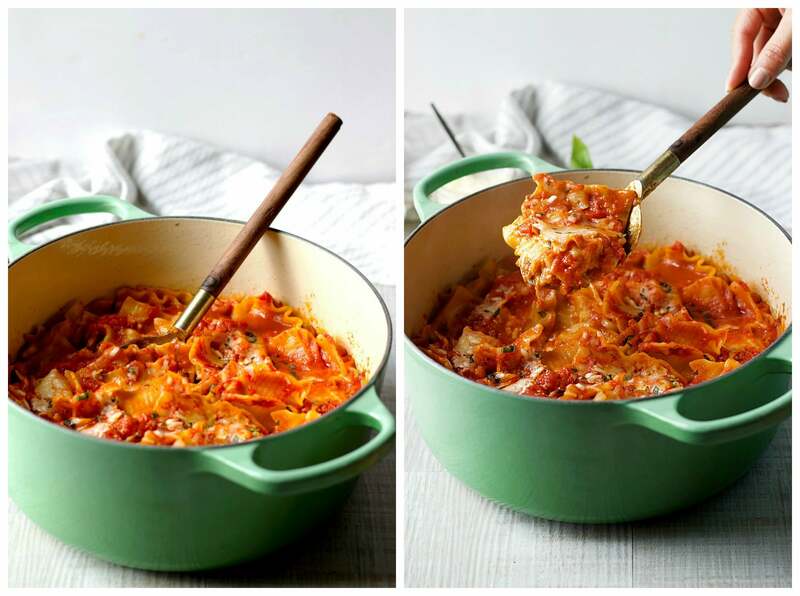 Easy One Pot Stovetop Lasagna with powerhouse nutritional bone broth! 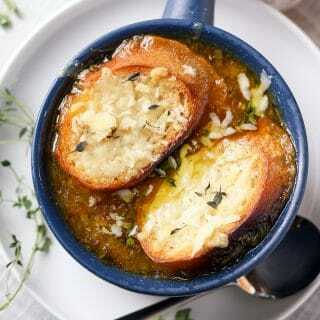 Add ground beef and work it with a wooden spoon to break into little pieces. Allow the beef to fully brown (about 15 mins). Drain the fat and bring back to stove. Dissolve 2 scoops of Vital Proteins Beef Bone Broth Collagen in hot water. Pour over the beef. Turn heat down to medium low at this point. Add in half of the lasagna noddles, then pour half of the marinara sauce over noddles. Top with half of the cheddar cheese. Repeat with remaining noddles, marinara and cheese. You can give pot a quick stir if you want, otherwise just lease as is. 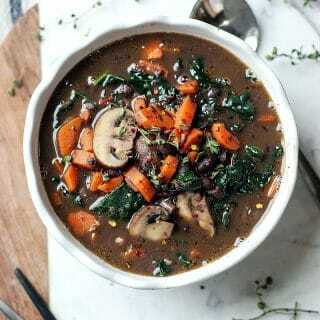 Cover the pot and allow it to cook for 20 mins. 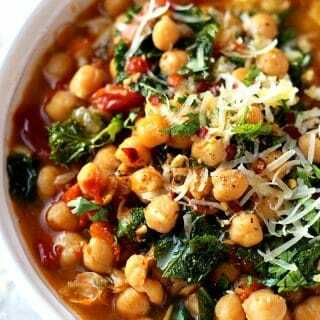 When done top with parmesan cheese and fresh basil. Awe thanks so much girls 🙂 It’s delicious!! Hi! Why cheddar cheese? I was surprised to see that! Hi Denise! which cheese do you usually use or like to use in Lasagna? I’ve used a bunch of different cheeses from American, mozzarella, cheddar, and a few others. I love this stove top option. Looks good!